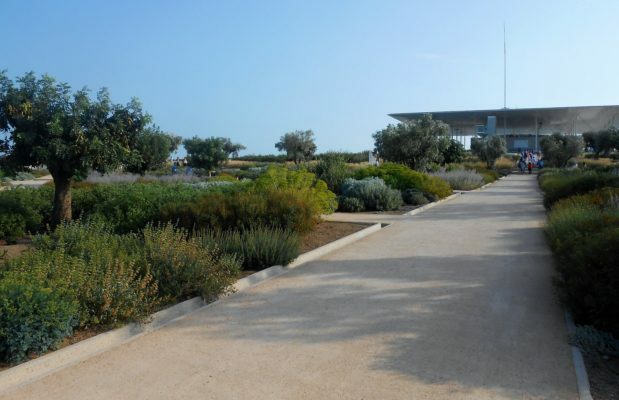 The Stavros Niarchos Foundation Cultural Center (SNFCC) is the new “entry” in town and a vital green space! 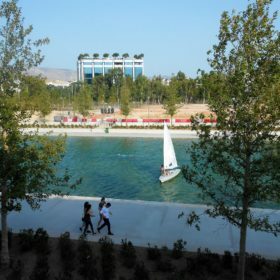 The project includes the new facilities for the National Library of Greece (NLG) and the Greek National Opera (GNO), as well as the 210,000 m² Stavros Niarchos Park that provides opportunities for learning, recreation, rest, and new experiences. 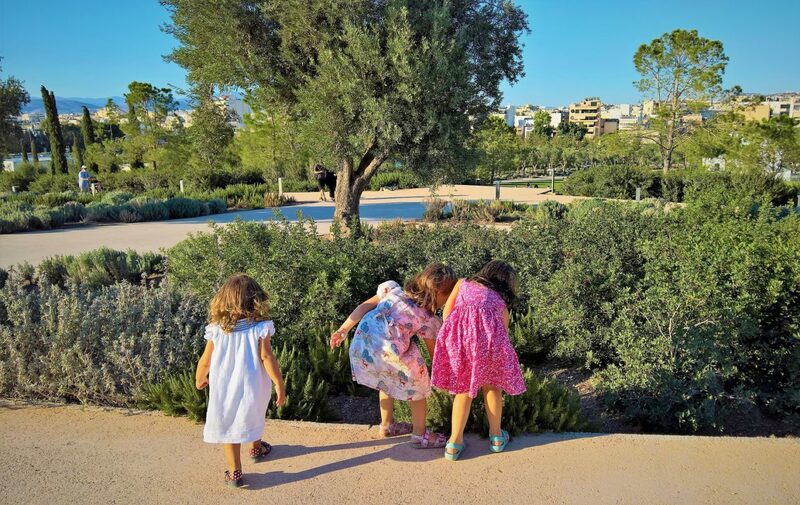 A popular weekend walk for families, the Stavros Niarchos Park offers many surprises to its visitors. Its lush garden landscape, featuring a wide range of trees, plants, water fountains, allées, paths, playgrounds and open spaces, turns every visit into a unique experience. 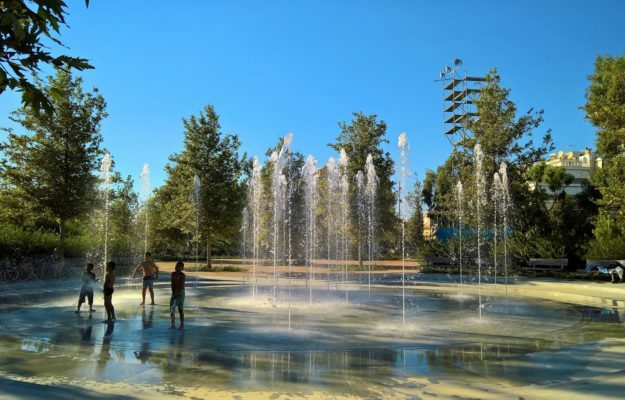 The Park is ideal for children, who can play undisturbed in its playgrounds, but also for all citizens and travelers to enjoy their leisure walk, exercise or attend concerts, exhibitions, and a multitude of other events. Greece’s strong horticultural tradition is celebrated in the open, sunlit Mediterranean Garden. The plant palette alone makes the garden a destination: evergreen and other endemic plants such as boxwood, coronilla, cistus, and lentisc, salvia, oregano, thyme, lavender, rosemary, roses and euphorbias – all add to the sensual pleasure of a visit. Each month brings a new color, and each season introduces a different combination of flowers or foliage. From the Mediterranean Garden, curving landscaped pathways wend their way up a gentle grade to a summit 32 m high. Beneath the earth is the building that houses the Library and the Opera, making the hill the green roof for the structure. One of the largest in Europe, the green roof significantly reduces air conditioning requirements. The summit offers spectacular 360-degree views of the sea to the west, the Acropolis to the east, and the cultural and educational park below, as well as of the Agora, the central plaza between the Library and the Opera House. 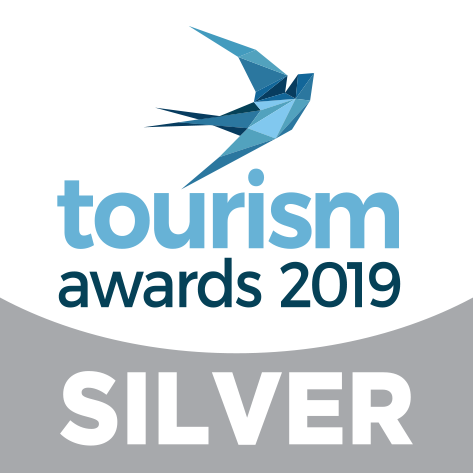 Another prize awaits the visitors of the Park’s summit: the 900 m2 glass-walled Lighthouse, a space for people seeking a quiet area to read and reflect or to appreciate the view but also an ideal space for events and exhibitions. The spectacular features of the Stavros Niarchos Park are not all earthbound. Soaring 14 m above the summit there is a 100m x 100m photovoltaic canopy. An engineering and construction wonder, supported by 40 sinewy metal pillars, the canopy makes a fascinating addition to the city skyline. At ground level, a tree-lined pedestrian Esplanade runs parallel to the glass façade of the structure. Alongside is the Canal, a figurative extension of the adjacent sea. The Esplanade readily accommodates people with special needs, and is suitable by day for running, biking, and other activities. Directly across the Agora and on the other side of the canal, wide marble steps offer a space for impromptu performances. 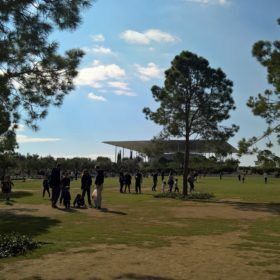 The tour involves exploring the Stavros Niarchos Park, a welcoming and open space reflecting the Mediterranean landscape. (Tour Duration: 60’/ Number of participants per tour: 20 people/ Free admission with pre-registration). For more information on group tours, you can contact tours@SNFCC.org. For the program of performances as well as for more information, visit the official website. In the park, you will find canteens to grab a coffee, juice or a light snack or sandwich, while in a very short distance from the park, you will find some of the best fish taverns in town with a yard that can accommodate families with young children, such as “Pezoulas”, at 11, Pisistratou street (+30.2109422684) and “Grandmother Elizabeth”, at 179, Xenofontos street (+30.2109428353). 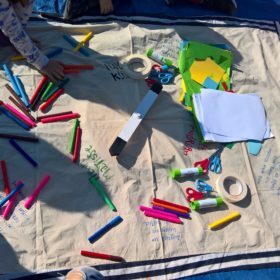 This entry was posted in English and tagged Athens with kids, Greece with kids, Niarhos, Niarhos Park, parks with kids Athens, SNFCC, what to do with kids.